1. Rinse the trout well in cold water. 2. Combine the salt, pepper, and flour in a shallow pan. Dredge the trout in flour and shake off any excess. 3. Heat the butter and oil in a skillet over high heat until very hot. Add the trout and reduce to medium-high heat. Sauté without moving on the first side for about 4 minutes, or until the skin is golden brown. Turn the fish once and finish cooking on the second side for another 3-4 minutes. 4. 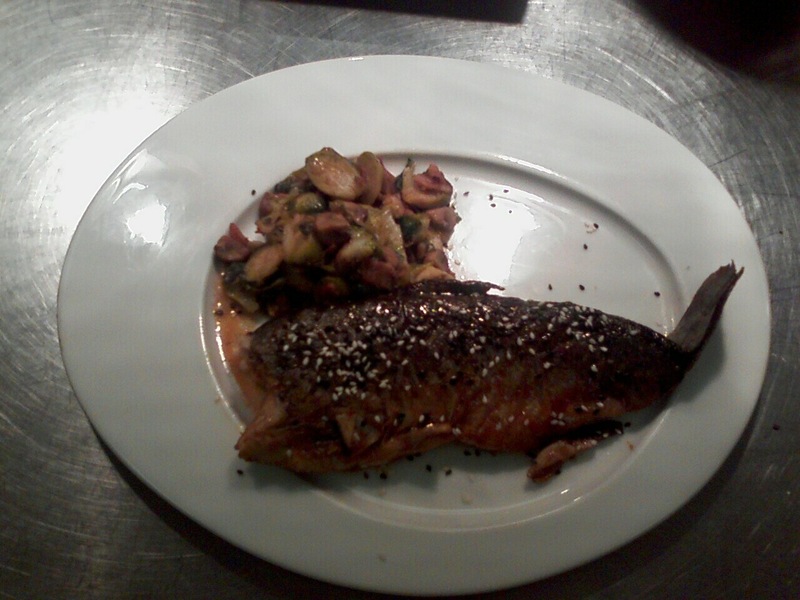 Remove the trout from the skillet and keep warm. Add the maple syrup and soy sauce to the pan. Increase the heat to high and reduce the mixture until thickened, about 2 minutes. 5. 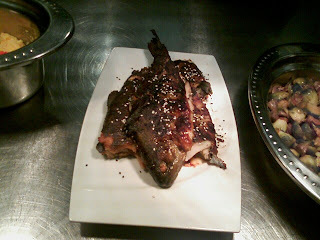 Return the trout to the skillet and turn to coat evenly with maple-soy glaze. 6. Serve trout sprinkled with sesame seeds. Trim the bottom of the Brussels sprouts and score an X into the bottom of each one with a pairing knife. 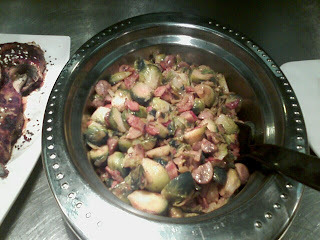 Cook the Brussels sprouts in boiling water until tender in the center. Shock. Sauté the bacon over medium-high heat in sauté pan until it is crisp. Add the butter, onions, and garlic and sauté for approximately 5 minutes or until the onions are translucent. Add the mushrooms and sauté for an additional 5 minutes or until the mushrooms are cooked. Cut the Brussels sprout in half and add to the onions and mushrooms. Season to taste with salt and pepper and sauté until thoroughly heated.